Each April, Earth Day gives us another opportunity to appreciate our wonderful planet and remind ourselves how important it is to protect our environment. As we’ve discussed before on this blog, a summer spent at camp provides a great opportunity for Maine Camp Experience (MCE) campers, many of whom hail from more industrialized areas, to really appreciate the natural beauty New England has to offer – and this connection and appreciation can help make them lifelong ambassadors of our planet. While this cultivation of respect for the environment is promoted in a number of ways at camp – such as hikes and out-of-camp trips, well-developed nature programs, and recycling and re-using initiatives, there is one area in particular where kids at MCE camps can experience firsthand the benefits of giving a little love to the environment. Some MCE camps integrate botany and agriculture into the program, where campers can learn to plant and harvest tasty vegetables, that are then incorporated directly into the meals they eat at the dining hall. This gives kids the opportunity to develop their green thumbs, and to taste the fruits (and veggies!) of their labor. At many camps, this type of program offering begins in a camp’s vegetable garden. Here, campers will grow many of the delicious greens (and other great bites like tomatoes) that populate the camps’ salad bars each day! However, this process doesn’t stop once meals are served – after each meal, these camps will compost their food-waste, and this fertilizer is then put to use in the camp garden, and ultimately contributes to the yummy meals they enjoy each day. Just like basketball, swimming, or zip-lining, this program will be integrated into campers’ everyday schedules. For example, campers can choose to do “farming and gardening” as an activity, where they get a firsthand appreciation for the work that goes into producing sustainable food, and can contribute directly to their camps’ sustainability efforts. Some camps even have chickens which produce the camps’ eggs, and honey-bee hives, which pollinate the flowers in their own gardens and on nearby farms, and produce yummy honey that campers get to enjoy with their meals! 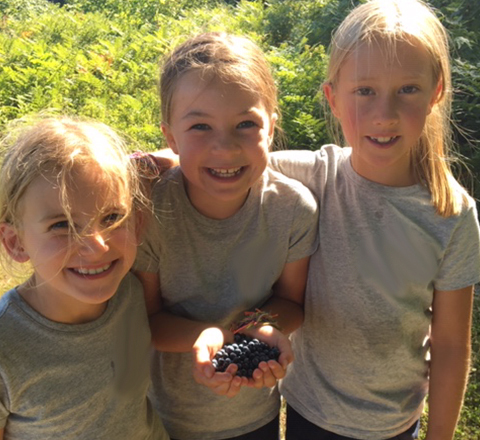 So, campers, if you want to eat delicious meals – and contribute to the ingredients your fellow campers will enjoy – head to a Maine camp this summer and get planting and picking!